WHAT - Snow occurring. Plan on difficult travel conditions. Tree branches could fall as well. Snow will be lighter Friday afternoon and evening, when 2 to 4 inches are expected. Heavy snow will return Friday night into Saturday morning, when another 6 to 10 inches are expected. WHERE - South Central Oregon Cascades and Southern Oregon Cascades above 4500 feet, including Diamond Lake, Crater Lake,and the passes along highways 62, 230, and 138. WHEN - Until 11 AM Saturday. The heaviest snowfall rates will occur between 11 PM this evening and 5 AM Saturday. ADDITIONAL DETAILS - Look for reduced visibilities at times. Slow down and allow extra time to reach your destination. * Carry tire chains and be prepared for snow covered roads and limited visibilities. * See weather.gov/Medford/Cams for latest road conditions. * A Winter Weather Advisory for snow means that periods of snow will cause travel difficulties. Snow levels will drop to between 4000 and 4500 feet by Friday morning. Expect several inches of snow tonight and Friday over the Cascades, with a few inches over the Siskiyous, and up to an inch over lower elevations on the East Side. A heavier round of snow will affect the area late Friday night into early Saturday morning ahead of an approaching warm front. Snow levels will remain 4000 to 4500 feet. 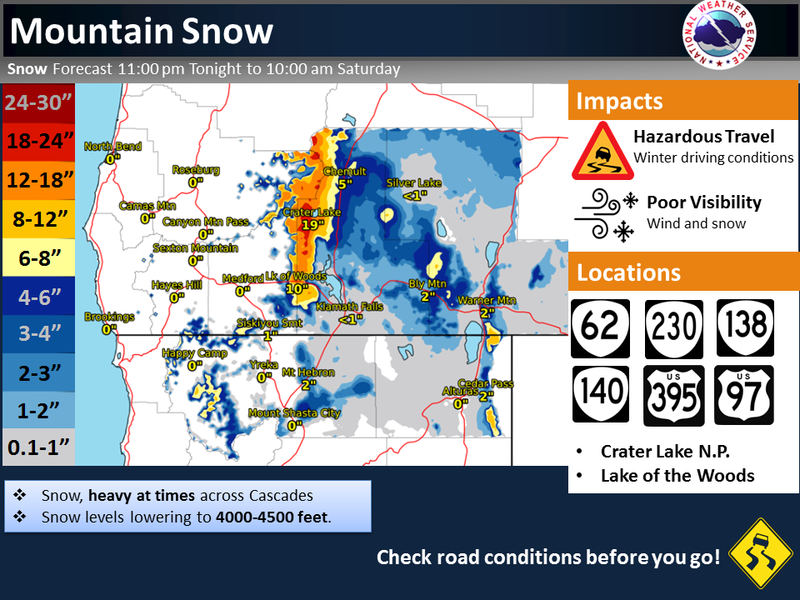 Expect around 8 inches of snow at Crater Lake, 6 inches at Lake of the Woods, and around 1 inch in most East Side valleys. Strong winds will also create blowing snow and white out conditions over exposed areas. Saturday afternoon, snow levels will rise significantly and we will see a transition to rain. When driving in ice and snow, take it slow! Make sure to carry chains, food, water, blankets, flashlights, medications, and a fully charged phone when traveling. Be sure to check road conditions before venturing out. You can call 511 for Oregon road conditions and for California road conditions call 800-427-ROAD (7623) or visit their websites listed below.